The 2018 Volkswagen Tiguan is a highly sought-after SUV among drivers in Toms River, Brick, Freehold, and Neptune Township for a reason. It combines efficient yet powerful performance with all the safety and technology features you could possibly want. Below, you can learn more about this impressive vehicle in a detailed review put together by our team at Toms River Volkswagen. Let’s get started! The 2018 Volkswagen Tiguan is powered by a turbocharged 2.0L TSI™ 4-cylinder engine and an 8-speed automatic transmission with Tiptronic® mode and Sport mode. The turbocharging and intercooling technologies of this engine allow for it to achieve an efficient EPA-estimated 27 highway/22 city MPG1. Additionally, this power duo is able to manufacture a whopping 221 lb-ft of torque and 184 horsepower. With this much power and other optional equipment selections, the Tiguan is able to tow up to 1,500 pounds. For even more confidence behind the wheel of the Tiguan, you can opt for the available 4MOTION® all-wheel drive system. This system lets you choose between four different drive modes so that the power you need is perfectly distributed to cater to your road conditions. Choose between Snow Mode, On-Road Mode, Off-Road Mode, and Off-Road Custom. The 2018 Volkswagen Tiguan was designed with the safety of you and your loved ones in mind. Standardly, you’ll have an Intelligent Crash Response System, Automatic Post-Collision Braking System, Tire Pressure Monitoring System, and seven stability-enhancing systems. Included in this cluster of systems is Electronic Brake-pressure Distribution and Electronic Stability Control. These features use advanced exterior sensors and cameras to constantly monitor your surroundings and even jump into action to help you prevent a collision if need be. To make every one of your adventures pleasant and stress-free, the 2018 Volkswagen Tiguan is fitted with a variety of convenience and entertainment features. 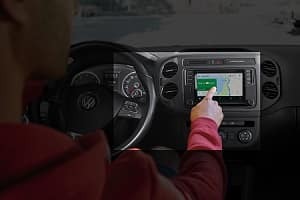 Standardly, you’ll have a 6.5-inch color touchscreen display infotainment system with a rear-view camera system, Bluetooth® audio streaming, and Volkswagen Car-Net® App-Connect. The latter feature is more than just a smartphone app integration tool. Not only will you have access to all your favorite apps right on the infotainment screen thanks to this feature, but you’ll also have turn-by-turn navigation, real-time traffic updates, weather information, and even easy access to help in an emergency. You can also opt for the available Volkswagen Digital Cockpit. This 12.3-inch display lives behind the steering wheel and provides you with a variety of information about your vehicle. It can also transform into a wide navigation map, so you don’t have to constantly be looking over to the infotainment screen for direction. Get Behind the Wheel of the Tiguan Today! Ready to get behind the wheel and see for yourself what the 2018 Volkswagen Tiguan can do? Shoppers in Toms River, Brick, Freehold, and Neptune Township should give us a call at Toms River Volkswagen today to schedule a test drive! 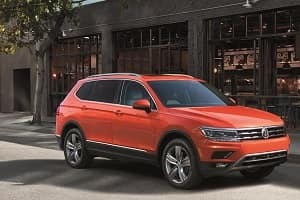 1 22 city / 27 highway mpg (2018 Tiguan 2.0L, 8-speed automatic transmission). EPA estimates. Your mileage will vary and depends on several factors, including your driving habits and vehicle condition.